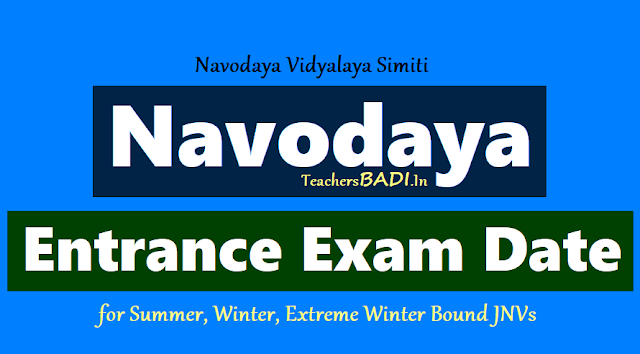 NVS Exam date, Navodaya Entrance Exam Date hase been announced for phase I Summer, Winter, Extreme Winter Bound JNVs 2018. Notification Regarding Conduct of Jawahar Navodaya Vidyalaya Selection Test 2018: The date of Jawahar Navodaya Vidyalaya Selection Test for admission of students to Class VI for the session 2019-2020 was notified as 4th April 2019 in respect of Summer Bound, Winter Bound and Extreme Winter Bound Jawahar Navodaya Vidyalayas respectively. Jawahar Navodaya Vidyalaya Selection Test 2018 for Summer Bound JNVs and JNVST will be conducted together for all Jawahar Navodaya Vidyalayas in one go. All the candidates are advised to note the same. The date of Phase I JNVST-2018 would be conducted on 06-04-2019. Jawahar Navodaya Vidyalaya 6th class Entrance test date 2019: The entrance exam for admission in class 6 will be held on April 6, 2019. A total of 31.10 lakh students have registered for the Jawahar Navodaya Vidyalaya (JNV) entrance test for the academic year 2019-20. “In 2001, 5.50 lakh aspirants appeared for the entrance examination for Class 6. Over the years the number of aspirants appearing for the entrance examination has increased considerably. For the 2019 entrance test, 31.10 lakh students have registered for the entrance examination,” said Union Human Resource Development Minister Prakash Javadekar. The Navodaya Entrance exam for admission in class 6 will be held on April 6, 2019. The registration process for the entrance examination was concluded on November 30, 2018. The admit card for the entrance examination will be released soon on the official website, nvshq.org. The exam is held for admission into various Jawahar Navodaya Vidyalayas (JNV). The languages in which the exam will be conducted included — English, Garo, Hindi, Urdu, Bengali, Punjabi, Sindhi (Arabic), Tamil, Telugu, Nepali, Oriya, Marathi, Assamese, Bodo, Gujarati, Kannada, Khasi, Malayalam, Manipuri, Mizo, Sindhi (Devnagari). Conduct of Jawahar Navodaya Vidyalaya Selection Test-2018 in all Phase I JNVs (Summer, Winter & Extreme Winter bound JNVs) on April 6, 2019. Navodaya 6th class entrance exam date, Admit Cards /Hall tickets 2019 download: Jawahar Navodaya Vidyalaya Selection Test-2019 (Phase-1) in respect of the following Jawahar Navodaya Vidyalayas will be conducted on 06-04-2019. Arrangement will be made to download the admit cards by the candidates from the website of NVS http://navodayahyd.gov.in. Candidates may contact Principal of JNV concerned and collect Admit Cards, in case of difficulty. 1. Use Blue/ Black Ball point Pen only to write on Answer Sheet. Use of Pencil is Strictly Prohibited. 2. The candidate is provisionally allowed to appear for the test subject to the fulfillment of the eligibility criteria at the time of admission to class VI is JNVs after selection. 3. Candidate is advised to report to the examination center latest by 10.30 am. 4. Candidate will not be permitted to appear for the test if reports after 30 minutes from the commencement of the test. 5. Every question will be having 4 Options. Students have to mention the number of the answer opted within the box provided against the question number. 6. Answers are not to be marked in the question paper since the candidates are permitted to carry the question paper after the completion of exam. 7. Answers are to be marked in the separate OMR/ICR sheet which will be provided along with question paper. 8. No change in the answer once written is allowed. 9. Do not use white/correction fluid on Answer Sheet. 10. Before answering the candidate has to ensure that question booklet contains 100 questions serially numbered from1 to 100. In case of discrepancy, the candidate should immediately report the matter to the invigilator for replacement of the question paper. The question paper of the same medium of examination may be collected and used. 11. No change of medium of question paper is permitted. Overwriting, cutting and erasing on the answer sheet is not allowed. Do not make any stray mark on the Answer sheet. Conduct of JNVST-2018 in summer bound, winter bound and extreme winter bound JNVs in one go on 6th April 2019. NVS officials decided to conduct JNVST-2019 in one go in respect of summer bound, winter bound and extreme winter bound JNVs on 06-04-2019. NOTICE: Navodaya Vidyalaya Samiti (An Autonomous Organization Under Ministry of Human Resource Development, Department of School Education & Literacy). Jawahar Navodaya Vidyalaya Selection Test 2018 for Class VI will be conducted on 6th April 2019 for all (Summer, Winter and Extreme Winter bound) Jawahar Navodaya Vidyalayas in one go . All the candidates are advised to note the same and refer to NVS website https://www.nvsadmissionclasssix.in/nvs6reg/homepage for further details including collection of admit card.